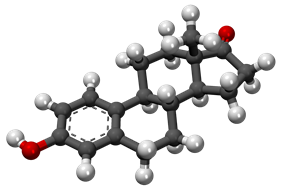 Estrone (E1, and also oestrone) is an estrogenic hormone secreted by the ovary as well as adipose tissue with the chemical name of 3-hydroxyestra-1,3,5(10)-triene-17-one and the chemical formula C18H22O2. Estrone is an odorless, solid crystalline powder, white in color with a melting point of 254.5 °C and a specific gravity of 1.23. Estrone is one of several natural estrogens, which also include estriol and estradiol. Estrone is the least abundant of the three hormones; estradiol is present almost always in the reproductive female body, and estriol is abundant primarily during pregnancy. Estrone is known to be a carcinogen for human females as well as cause breast tenderness or pain, nausea, headache, hypertension, and leg cramps. In men, estrone has been known to cause anorexia, nausea, vomiting, and erectile dysfunction. Estrone is relevant to health and disease states because of its conversion to estrone sulfate, a long-lived derivative. Estrone sulfate acts as a reservoir that can be converted as needed to the more active estradiol. It is the predominant estrogen in postmenopausal women. Estrone was discovered and isolated by German chemist Adolf Butenandt. The official chemical name of estrone is 3-hydroxyestra-1,3,5(10)-triene-17-one with the chemical formula C18H22O2. Estrone is also named aquacrine, bestrone, crinovaryl, folliculin, 1,3,5-estratriene-3-ol-17-one, estro-a, estronol, erystogen, 3-hydroxyestra-1,3,5(10)-trien-17-one, kestrone 5, propagon-s, menagen, theelin, theogen, destrone, aquacrine, crystogen, oestrin, 1,3,5(10)-estratrien-3-ol-17-one, 1,3,5(10)-oestratrien-3-ol-17-one, and oestrone. Estrone is a white, solid crystalline powder that is odorless. It has a melting point of 254.5 °C (490 °F) and has a specific gravity of 1.23. At high temperatures estrone is combustible and the products of combusting estrone are carbon monoxide (CO) and carbon dioxide (CO2). Estrone has been proven to be a known carcinogen for human females. The Occupational Safety and Health Administration (OSHA) classifies estrone as an OSHA Select carcinogen. Exposure to estrone can cause breast tenderness or pain, cervical hyper secretion, menstrual disorders including menorrhagia and metrorrhagia, nausea, headache, hypertension, leg cramps, vision disturbances, and endometriosis pain in women. Mothers lactating can also experience a decrease in the production of breast milk. Estrone can be found in the urine of pregnant women and can also be excreted in feces. Exposure to estrone can cause anorexia, nausea, vomiting, edema, feminization including gynecomastia and erectile dysfunction in men. If exposure of estrone to the eyes occurs, contacts should be removed and rinsed with water for 15 minutes. If any irritation occurs medical attention may be necessary. Exposure of estrone to the eyes can be prevented through the use of safety goggles. If exposure of estrone to the skin occurs, the effected area should be washed with soap and water and then covered with an emollient or moisturizer. Medical attention may be necessary if irritation persists. Exposure of estrone can be prevented through the use protective gloves, the wearing of pants, shirts that cover the entire upper body, and lab coat. If inhalation of estrone occurs, one should move into the fresh air. If breathing ceases, artificial respiration should be administered. For difficult breathing, oxygen should be given. Medical attention may be necessary if breathing continues to be difficult. Inhalation of estrone can be prevented through the use of a dust respirator. If estrone is ingested, vomiting should not be induced. Medical attention may be necessary. The used of estrone in norsteroid, a derivative of steroids, and in medications can cause its release into the environment through waste streams. ^ a b c d e "Material Safety Data Sheet Estrone" (PDF). ScienceLab.com. Retrieved 21 February 2013. ^ a b c d e f g h i j "Estrone". OSHA. Retrieved 21 February 2013. ^ "Estrone -PubChem". National Center for Biotechnology Information. Retrieved 2009-09-06. ^ a b c "Estrone-Compound Summary". PubChem.com. Retrieved 21 February 2013. ^ Helen Varney, Jan M. Kriebs, Carolyn L. Gegor. Varney's midwifery, Fourth Edition. Jones and Bartlett Publishers, 2004, p. 340.